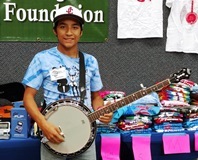 The Bluegrass Heritage Foundation continues presenting instruments to young people in and around Texas through our Play It Forward!™ Instrument Lending Program. The latest is 14-year-old Brian Janvier of Johnson City, Texas (pictured at left). Brian plays percussion in band at school, is a solid guitar player, and is very excited about learning to play bluegrass on the banjo! Gigi Jennings, an 8-year-old from Tyler, Texas, got her first fiddle through the program and is working hard to develop her “bow arm”! We are happy to help these fine young folks who want to learn and play bluegrass music, and we appreciate all who have supported the Foundation with donations and instruments.